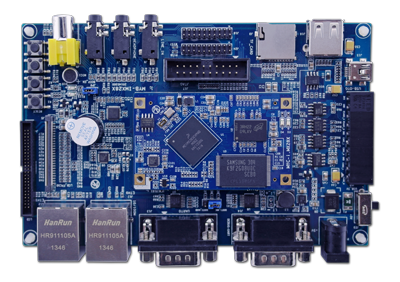 The MYD-IMX28X Development Board designed by MYIR is a cost-effective and power-efficient ARM Evaluation Kit (EVK) for NXP i.MX28 family of multimedia applications processors which has an ARM926EJ-S Core, with speed up to 454 MHz. 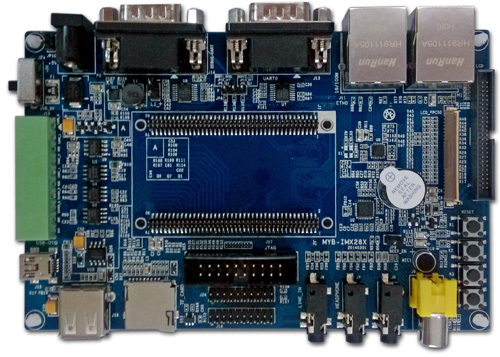 The board can support running Linux operating systems, which allows developers to use it as an i.MX28 reference platform to quickly start their own design. 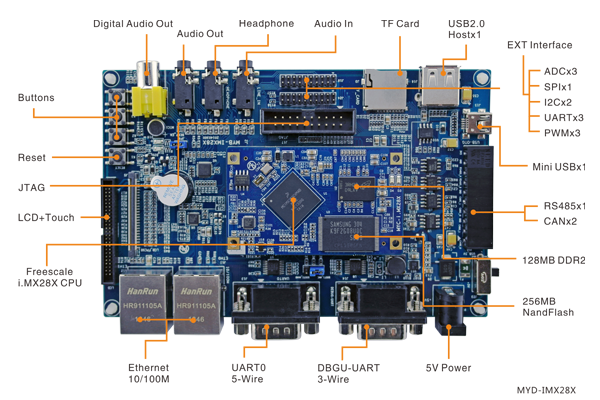 The board takes full features of the i.MX28 ARM processor and has exposed a comprehensive set of peripherals and connectivity options to make the board suitable for smart gateways, human-machine interfaces (HMIs), handheld devices, scanners, portable medical, experimental education and more other industrial applications. 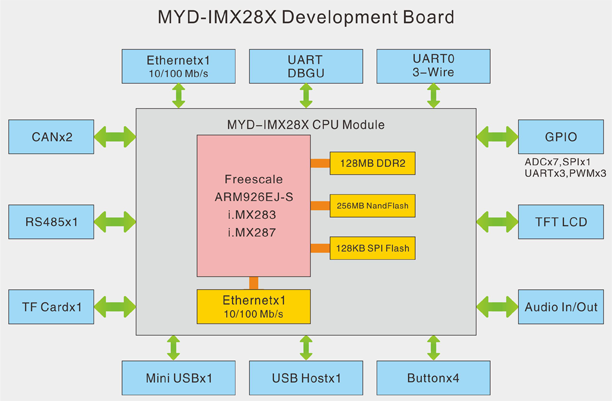 The MYD-IMX28X Development Board is using the MYC-IMX28X CPU module as the heart of the system which is an ARM9-based system-on-module (SOM) integrated with the i.MX28 processor, 128MB DDR2 SDRAM, 256MB Nand Flash and Ethernet PHY. It is connected to the base board through two 1.27mm pitch 80-pin connectors. 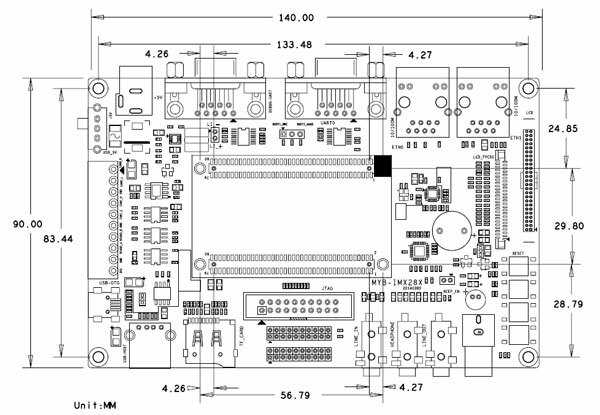 The base board has extended many peripherals and interfaces through headers and connectors, featuring 1 x RS232, 1 x Debug, 2 x USB ports, up to 2 x Ethernet, 2 x CAN, 1 x RS485, TF, Audio, LCD, JTAG, etc. 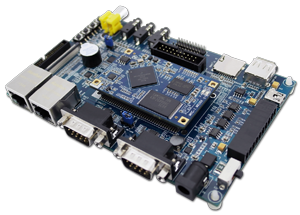 MYIR offers the board with Freescale i.MX283 or i.MX287 ARM9 CPU by default; user can integrate a different MYC-IMX28X CPU module on the same base board, thus making two variants of i.MX28 evaluation boards. 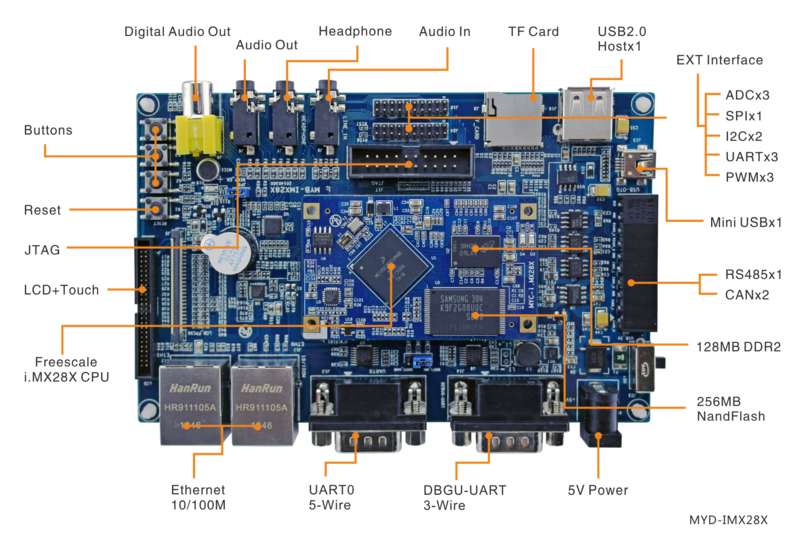 The MYD-IMX28X board comes with Linux2.6.35 software packages, detailed documents, necessary cable accessories as well as optional 4.3- and 7-inch LCD (with resistive or capacitive touch screen), WiFi, GPS and GPRS modules to provide a complete Freescale i.MX28 starter kit and enable a quickly start of evaluation of i.MX28 family applications processors. The i.MX28 is a low-power, high-performance applications processor optimized for the general embedded industrial and consumer markets. The core of the i.MX28 is Freescale's fast, power-efficient implementation of the ARM926EJ-S™ core, with speeds of up to 454 MHz. The integrated power management unit (PMU) on the i.MX28 is composed of a triple output DC-DC switching converter and multiple linear regulators. These provide power sequencing for the device and its I/O peripherals such as memories and SD cards, as well as provide battery charging capability for Li-Ion batteries. The i.MX28 processor includes an additional 128-Kbyte on-chip SRAM to make the device ideal for eliminating external RAM in applications with small footprint RTOS. 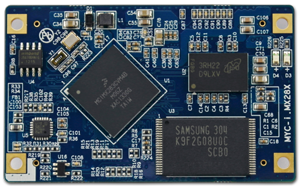 The i.MX28 supports connections to various types of external memories, such as mobile DDR, DDR2 and LV-DDR2, SLC and MLC NAND Flash. The i.MX28 can be connected to a variety of external devices such as high-speed USB2.0 OTG, CAN, 10/100 Ethernet, and SD/SDIO/MMC. 1. 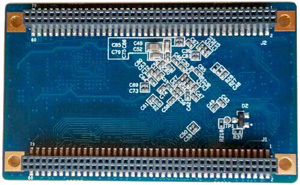 One MYD-IMX28X Development Board includes one CPU module MYC-IMX28X mounted on the base board. If you need more CPU module, you can order extra ones. Please contact MYIR to specify i.MX283 or i.MX287 CPU you need after placing order. 3. The boards are of industrial grade can work in -40~85 Celsius. 4. We accept custom design based on the MYD-IMX28X, whether reducing, adding or modifying the existing hardware according to customer’s requirement.